Increased funding to make farming easier is a priority, an expert told California Ag Today recently. LaKisha Odom is the science program director for the Foundation for Food and Agricultural Research based in Washington, DC. Funding sound science is a goal for the foundation. “We are interested in increasing the amount of funding that is available to make farming and decision making easier,” Odom said. This is all based on sound science. Their foundation base depends on the readily available funding. “We match public-private dollars and increase that amount of funding available to fund sound science,” she explained. The funding is for foundations and agencies that will assist farmers. “The universities, industry partners, foundations and the research that’s funded by those entities can then inform those decision makers to assist those farmers who are making those decisions,” she said. “We were provided $200 million dollars in the 2014 Farm Bill,” Odom added. There are seven challenge areas that the foundation focuses on: water scarcity; urban agriculture; food waste; food loss; making my plate your plate, which focuses on nutrition; protein challenge, which focuses on animal sustainability; and innovation pathways. Fresno State is one of the founding partners. “I’m working with the irrigation innovation consortium, which is a consortium of university partners as well as industry partners, and Fresno State is one of our partners in that,” Odom said. They are working with Dr. Davis at Fresno State for ways in which they can make innovations in irrigation and make water issues a little less challenging for farmers. Becky Langer, the project manager for the North American Bayer Bee Care Program, recently spoke with California Ag Today about Bayer Forward Farms — a knowledge platform that demonstrates sustainable agriculture and practice through agronomic solutions and proactive stewardship measures — and their recent introduction to the U.S. Forward Farming started in Europe. It is coming to the United States this year. “We will launch our first forward farm in the Chesapeake Bay area in April of 2018,” Langer said. Forward Farms are independent farms that represent the region in which they are located. 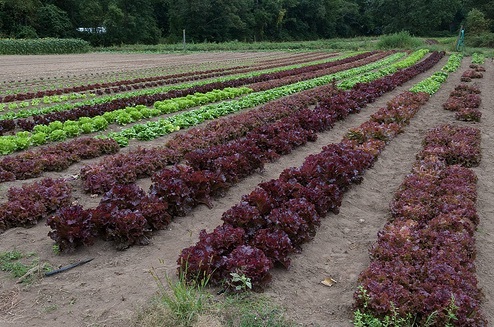 These farms showcase sustainable agricultural practices and highlight the benefits of sustainable farming. They hope to expand to California within the next year or two and eventually into the Midwest or the south. “Ideally, we are going to cover the different cropping systems that we see in the United States because the Forward Farm ideally focuses on farms that are representative of their region within the crop and size of it,” Langer said. The Chesapeake Bay has soy, wheat and corn. 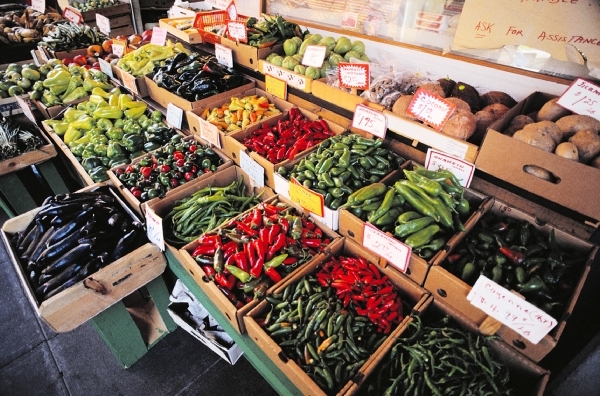 In California, they hope to focus on some horticulture, nuts, fruits and vegetables. In the Midwest will be another large corn operation. The goal of these Forward Farms is demonstration. “We want to demonstrate that those farmers have a passion for sustainability. They are using it in practice on their farms and that this goes hand in hand with environmental and social responsibility,” Langer said. The goal is to have modern agriculture along with sustainability. Things will focus on soil, cover crops, habitat enhancement, biodiversity on land, water conservation, and worker safety. “Those are all critical when we talk about sustainability in modern agriculture, and so those will be real drivers in the conversation,” Langer explained. Through a competitive grant program, the Agricultural Water Use Efficiency & State Water Efficiency and Enhancement Program, the California Department of Water Resources (DWR) and the California Department of Food and Agriculture (CDFA) jointly intend to demonstrate the potential multiple benefits of conveyance enhancements combined with on-farm agricultural water use efficiency improvements and greenhouse gas reductions. sustainability of agricultural operations and food production. It is also anticipated that there will be benefits to water and air quality, groundwater security, surface water conservation, and improved nutrient management and crop health through this program. Excellent proposals will demonstrate the specific regional needs and benefits of their proposals. 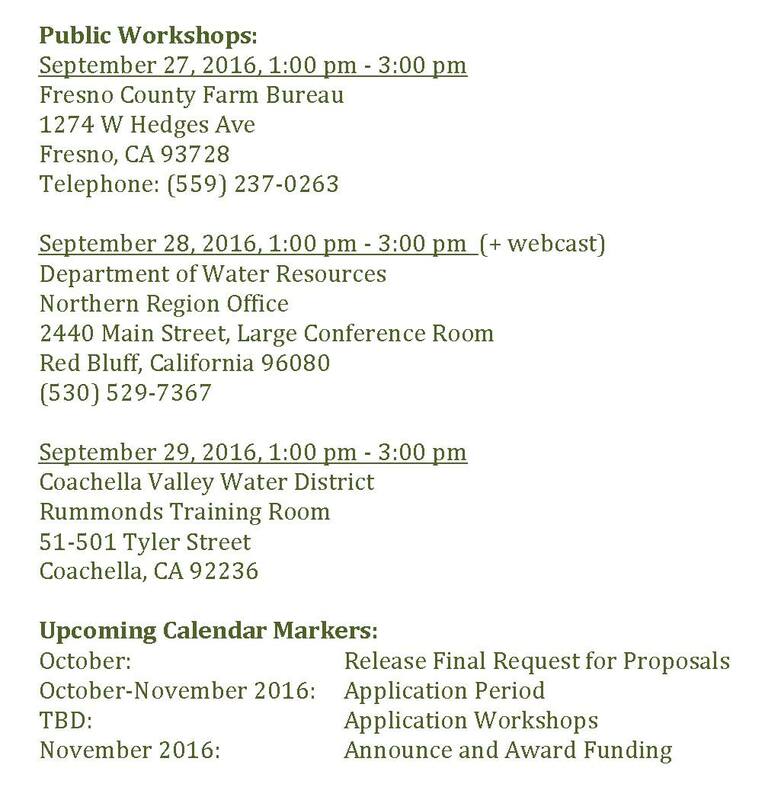 Deadline for submitting public comments is September 30, 2016. The program will be administered as a competitive grant program and will include a joint application process involving agricultural water suppliers and agricultural operators within the service area. Projects that enhance and upgrade the supplier’s water conveyance, delivery and water measurement system to allow on-demand and flexible farm-gate deliveries, reduce spills and losses, increase the efficiency, and improve water management. A water supplier’s proposed project must generate State benefits to be eligible for grant funding. increased local water supply reliability. The project must be located within California. On-farm agricultural operations must achieve both GHG emission reductions and water savings to be eligible for funding. In addition, projects must: (i) use the associated improvements made to the surface water conveyance system proposed by the associated agricultural water supplier as part of the joint application, and (ii) eliminate on-farm groundwater pumping. To be eligible for funding, projects are not required to be in an adopted Integrated Regional Water Management Plan or to comply with that program, but preference will be given for projects that are. The following entities involved with water management are eligible to apply: Public agencies, public utilities, federally recognized or state Indian tribes on California’s Tribal consultation list, nonprofit organizations, mutual water companies, and investor-owned utilities regulated by the California Public Utilities Commission. Applicants that are agricultural water suppliers and/or urban water suppliers should inquire for further information. DWR has set aside $3 million from Proposition 1 to incentivize the water conveyance component of this joint agricultural water use efficiency and enhancement program. Proposition 1 requires that agricultural water suppliers provide a 50% cost share of total project costs. CDFA has also set aside $3 million from the Southwest Energy Efficiency Project (SWEEP) to incentivize the installation of irrigation systems that save water and reduce greenhouse gases on farms in the area that will directly benefit from the conveyance system incentivized by DWR. The maximum grant award per agricultural operation is $200,000 with a recommended, but not required, 50% match of the total project cost. CDFA reserves the right to offer an award different than the amount requested. Separate contracts with each department will be necessary to receive both sets of funds. A joint proposal may include a request for up to $3 million for the water supplier’s conveyance upgrades (to be funded by DWR) and up to $3 million for enhancements of on-farm agricultural operations to be funded by CDFA (with a cap of $200,000 per operation). This would allow for 15 agricultural operations (at $200,000 each) to partner with the water supplier to submit the joint proposal at the maximum award amount of $6 million. More than 15 agricultural operations could be funded if amounts lower than the cap are requested in individual agricultural operator applications. While it may not always seem that consumers view agriculture favorably, David Spady, Americans for Prosperity of California state director, said agriculture is actually viewed positively, as demonstrated through the “So God Made a Farmer” Ram 2013 Super Bowl ad, an extended version of the “So God Made a Farmer” video based on the speech authored and narrated by legendary radio broadcaster Paul Harvey and produced by the truck manufacturer to commemorate Ram’s “Year of the Farmer.” Spady also included FarmersOnly, the online dating site, as portraying a positive view of agriculture, among other programs and outreach. Spady suggested one way farmers can maintain the value placed on agriculture is by using the buzzwords that anti-agricultural groups have used against agriculture—in favor of agriculture. “Sustainability has become a very common buzzword,” Spady said, “but it’s very important to project [sustainability] with the idea of farming because farming is sustainable—sustainable for not just our food production but also for the environment,” he affirmed. to advocate for public policies that champion the principles of entrepreneurship as well as regulatory and fiscal restraint. to mobilize citizens to advocate for policies that cut red tape and increase opportunity and get the economy working for hard workers–not special interests. AFP mobilizes citizens to effectively make their voices heard in public policy campaigns. We build coalitions of like-minded organizations in California fighting for the common cause of lower taxation and free market principles. AFP California educates citizens about where their elected officials stand on our issues. AFP combines state-of-the-art national capabilities with local on-the-ground armies to create Grassroots operations that win. Through its Grassroots Training Schools, AFP Foundation has recruited and educated thousands of citizens on how to promote greater economic prosperity. When considering the longevity of a farmer’s land, the question of the sustainability of modern day farming practices is often raised. Scott Steinmaus, professor and department head of the Horticulture and Crop Science Department at Cal Poly San Luis Obispo, said that it is important to get the message out to consumers that farmers are sustainable because their land is the future for their own children. Steinmaus said it is important for consumers to realize that farmers are humans too, and they care about the health of the planet in a way that more directly relates to their careers.